← Why is that guy still here…? I read an interesting article this week from the Deutsche Welle. The central theme was China’s goal to be the world’s top innovator by 2030. By 2049 China also intends to lead the world in science and technology; just in time for the 100th anniversary of the People’s Republic. Innovation is becoming the new battle ground not only for business, but for government. 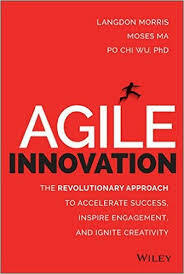 Enter the book, Agile Innovation. This rich repository of ideas details how to collaborate with customers, discover unspoken needs through ethnographic research and most importantly purposely design a culture of innovation unique to your company. The book leans heavily on existing norms. It describes a detailed vision of safe collaborative global cooperation. Innovation doesn’t need to “break the bank”. The book argues it’s not the amount of innovation, but the quality that matters. Agile Innovation, is challenging, refreshing and possible. Short, well defined innovative steps will not only keep your business in the game, but possibly make your company a world leader well ahead of 2030! This entry was posted in Good Books & Papers, Recent Posts, Scrum Master Stuff and tagged Agile Scrum, Innovation, Kaizen, Larry Lawhead, learning from failure. Bookmark the permalink.